Brandon has carried a legendary status tag ever since being one the first residents on the Space terrace, Ibiza. His residency alongside Alex P was arguably one of the initial driving forces behind the clubs worldwide notoriety as one of the best places to party. Brandon’s success and infectious personality lead to a stream of fantastic opportunities throughout the entire music industry. The highlights of this include, hosting one of the highest rated radios shows on Kiss FM (+ spin off compilations albums! ); His own show on MTV, Blockos Bits on Rapture TV and a number 3 charting hit under his Blockster moniker with “You should be Dancin”. Though Brandon has become more discerning over the years, the raw energy his DJ sets bring to dance-floor remains. Musically Brandon has a wealth of experience and is a staunch champion of the funkier end of house. 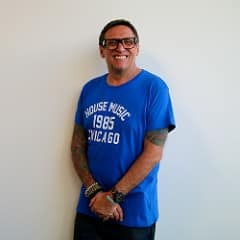 His continued success means Brandon Block is still one of the UK’s most sought-after DJs with his diary generally full up to 6 months in advance! In addition to his DJ work, Brandon has launched his own specialist international travel DJ bag, The Blox Box and has recently co-produced a record ‘Don’t You Feel Like Love’ with one of the UK’s hottest house music acts, The Hoxton Whores. Join Brandon Block and Ricky Morrison on the third Wednesday of the month from 7 pm, only on Mi-Soul.